His words about "the globalization of indifference" are understood to refer not only to the general indifference to the attacks on Christians in this region but also to the great indifference of the international community to the year-long civil war in this impoverished country, which has brought it to the brink of catastrophe. The previous day he expressed the hope that "this pointless slaughter will awaken consciences, lead to a change of heart and inspire all parties to lay down their arms and take up the path of dialogue." One of martyred sisters, Sister Anselm, was from India; the other three were from Africa: Sisters Margherite and Reginette from Rwanda and Sister Judith from Kenya. “Their names do not appear on the front page of the newspapers, but they gave their blood for the church,” Francis stated. 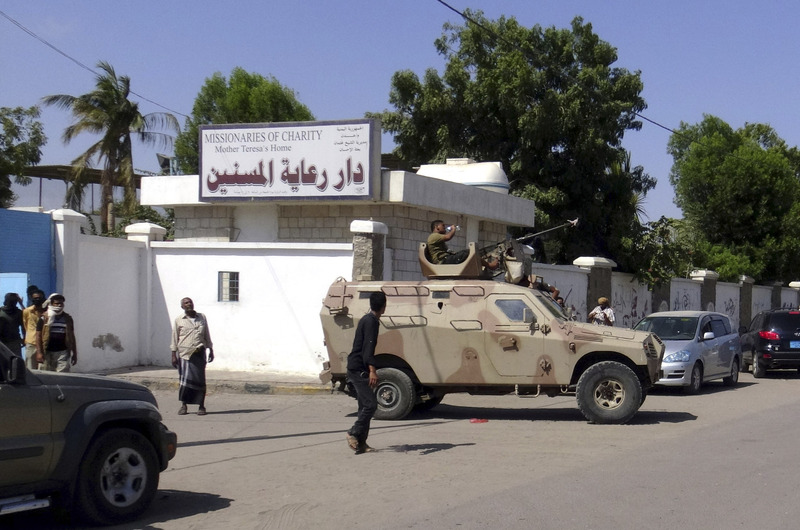 The Vatican said he was “shocked and profoundly saddened” by the murder of four Missionaries of Charity and 12 other people at a retirement home for the elderly (80 of whom lived there) run by the sisters in Aden, last Friday morning. Gunmen entered the building where they lived and went room-to-room, handcuffing victims before shooting them in the head, killing at least 16 people. Medical sources told Al Jazeera that the other victims included four local nurses, four security guards and three cleaning staff. The killing of these four sisters brings to a total of seven the number of Missionaries of Charity who have died as martyrs in this land, on the southern coast of the Arabian Peninsula, over the past two decades. In 1998, three other sisters—Zelia and Aletta (India) and Michael (the Philippines)—were killed at Hodeida, another city in this war-torn land where Catholics count for a mere 3,000 faithful (migrant workers) in a population of some 25 million people. In 1973, Mother Teresa was invited to open a mission in the country by the then government of North Yemen. She agreed but asked that they could also have priests. Her request was granted and the Salesian order provided the priests, and five of them are living in the country today. One of the priests, the only Catholic priest in Aden, Fr. Thomas Uzhunnali, from Kerala, India, was living with the sisters in this building at the time of the attack, since his parish residence was destroyed last September. He was praying in the chapel of the retirement home when the killers arrived, and was taken away by them, according to the mother superior of the community of Missionaries of Charity in Aden who, press reports say, managed to hide and so avoided being killed in the attack. It is not known what happened to him. The Holy See and the Republic of the Yemen, an Islamic state, established diplomatic relations in October 1998, and it was hoped then that this would guarantee some protection to the tiny Christian community there and make it possible for them to carry out their mission, such as that done by the Missionaries of Charity in caring for the elderly and the disabled. In the civil war, however, even the poorest and those who serve them have little protection. In 2011 Yemen experienced the Arab Spring protests, along with Egypt, Tunisia, Bahrain, Libya and Syria. Worried that these could spill out of control or even beyond its borders, the BBC reports that Yemen's Gulf Arab neighbors brokered a deal that saw longstanding President Ali Abdullah Saleh deposed and replaced by President Abdrabbuh Mansour Hadi. Mr. Saleh remained in the country, however, and in 2014, threw his support behind a rebellion by the Iranian-backed Houthi rebels, enabling them to march almost unopposed into the capital, Sanaa. By January 2015, the U.N.-recognized President Hadi had lost power and fled into exile in Saudi Arabia. By March 2015, the Shiite rebels had taken over the whole of western Yemen, where the bulk of the population is concentrated. According to the BBC, the Saudis and their Gulf Arab allies saw this as an Iranian takeover, and fearing that Iran was about to seize control of the port city of Aden and the strategic entrance to the Red Sea, through which thousands of ships pass each year, they formed a nine-nation coalition. In March 2015, the Saudis began a massive campaign of airstrikes, targeting both the rebels and the units loyal to Mr. Saleh, but by December 2015 the Shiite Houthis still remained firmly embedded in the capital and much of the north. Today, the Shiite Houthi rebels control the northern region but are being hit hard by Saudi-led airstrikes. The Saudi-backed internationally-recognized government controls the southern region, but there is great instability here too. Yemen effectively has two capitals—Sanaa and Aden—as the country continues to be trapped in a war that neither side seems to be winning. Aden descended into lawlessness after the Saudi-led coalition recaptured this key city from the Shiite rebels last summer, but both Al Qaida and the Islamic State are now active there. At the end of last year, the BBC reported that Yemen’s basic infrastructure was shattered, its economy was grinding to a halt, and at least 80 percent of the population was dependent on food aid. Peace talks opened in Switzerland last December but so far have not managed to end this civil conflict in which Saudi Arabia and Iran are deeply engaged. Already the poorest country in the Arab world, with ever-decreasing oil and water reserves, Yemen is now facing catastrophe according to the United Nations: 21.2 million people need some form of humanitarian assistance, around 6,000 people have been killed, and 2.4 million people have been displaced from their homes. Human rights organizations say both sides are responsible for atrocities in this impoverished but strategically important land where the tussle for power has serious implications for the region and the security of the West. The U.N. Security Council needs to intervene, but that is not happening. The globalization of indifference still reigns supreme, and people die. There are far too many incidents such as this across the region, and they seem to be acceptable. While i condemn the western nations for not raising their voices in defense of Christians, I also raise my voice to say that The Qu'ran prohibits these actions as well. Where are the voices of Islam condemning the injury and murder to defenseless people--those who are entitled under Shariah Law to special protections? We live in a better world than this. May God protect those whose life is dedicated to reducing the suffering of others, and take into his hands the immortal souls of these kind and faithful women. The Pope chooses for his own reason to ignore the root cause of violence,Islam, against Catholics, members of other non-Muslim religious beliefs in the Middle East and other areas of the world. "The Quran contains at least 109 verses that call Muslims to war with nonbelievers for the sake of Islamic rule. Some are quite graphic, with commands to chop off heads and fingers and kill infidels wherever they may be hiding. Muslims who do not join the fight are called 'hypocrites' and warned that Allah will send them to Hell if they do not join the slaughter." "http://www.thereligionofpeace.com/pages/quran/violence.aspx The internecine warfare between Islamic sects only adds to the violence against all Catholics and non-Muslims in the Middle East today. For over a thousand years the Catholic Popes and Catholic leaders led victorious battles against the Muslim efforts to conquer Europe. The mantra that "Islam is peaceful" defies the facts. "Mohammed is recorded as dying, on or about, 632 AD. And what followed was not an "under siege" mentality. Wars for enrichment followed. Islam had its own agenda long before the Crusades. If peaceful -- what were Muslim armies doing in Europe 300 years before the Crusades? And hundred of years thereafter? Seventy-seven years after Mohammed's death, in 711 AD -- some 300 years prior to the first Crusade -- it was Muslim military forces who crossed the Straits of Gibraltar from North Africa into Spain and in less than a decade crossed the Pyrenees. In 732 AD , the Muslim forces under the command of Abd-er- rahman, were decisively defeated by Charles Martel and the Franks at the Battle of Poitiers [Tours]. 800 years later in 1571 the fleet of the Ottoman Empire was defeated at the Battle of Lepanto by the fleet of the Holy League, a combined naval force of Catholic countries led by Don John of Austria and contained vessels from Venice, Spain, the Papal States, Genoa, Savoy, and Malta. Nine hundred years later, in September 1683 AD -- Ottoman Empire Muslim armies led by the Turkish commander Grand Vizier Kara Mustapha were at the gates of Vienna. They were defeated by a combination of Austrian, German, and Polish armies. If peace was Mohammed's message -- a subtle proposition at best -- his adherents missed the point then and miss it now."